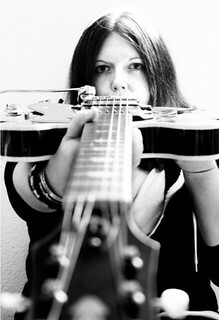 Jana Pochop (the ‘h’ is silent) began her vastly diverse career as an independent singer-songwriter when, as a child, she asked for a drum kit and her parents got her a guitar instead. She discovered Mary Chapin Carpenter and Shawn Colvin at the age of 11 and found a beautiful purpose for that guitar. Her instinct for deep grooves and poignant lyrics are obvious on her most recent musical offerings, onetwothreescream’s Lit released in 2018, her 2017 singles, and her 2014 EP Throats Are Quarries. Jana combines her gifts; lyrics that are as fearless as they are vulnerable, as skeptical as they are hopeful – woven into beautiful and fully fleshed arrangements. onetwothreescream (all one word…say it really fast) is a duo project formed in Austin, Texas, the brainchild of Jana and producer Mark Addison. Mark produced Jana’s folk-rap, Money & Heart, at his homebase Aerie Studio in the summer of 2017. The pair clicked creatively and found they share similar views on the melding of smart lyrics and pop beats that make your cells rearrange when you crank up the volume. Lit is six songs of pure folk pop, an amalgamation of two artists who believe that making a serious statement can align with a not-so-serious approach to the music. From the cinematic storyline in “18 Hours” to the atmospheric creepiness of “The First Cold War” to the post-apocalyptic party folk of “Fault Lines,” onetwothreescream delivers a pop EP imbued with the tension of our modern times. Likewise, 2014’s Throats Are Quarries completed a trilogy of EPs crafted by Jana and producer Daniel Barrett, affirming that she’s got one foot firmly planted in the grassy-rootsy folk genre while the other stomps around the pop world like a boss. Jana Pochop hails from the culturally rich Albuquerque, NM, where she earned a degree in History from the University of New Mexico, all the while playing coffeeshops, street corners, and hippie festivals. She says it was at the University where she learned how to learn…a skill that she uses constantly while maneuvering the ever-changing music business. She honed her performance chops at open mics and opening slots, and in 2006, moved to Austin to close the gap in her pursuit of a career in music. Jana has allied with many of the Texas music makers like Terri Hendrix, Susan Gibson, Elizabeth Wills, and Michael O’Connor. She has gotten a lot of field experience traveling with Gibson as tour manager / documentarian over their 10 years of working together, and Jana has toured everywhere from Seattle to Sweden with Gibson. In 2016, Pochop joined Kiya Heartwood’s band on electric guitar and toured Ireland and the U.K., playing Fringe Festivals in Edinburgh and The Isle of Wight. Jana knows first hand that all independent singer songwriters must be part entertainer, part entrepreneur. Besides the musical mark Jana is making, she has carved another niche by helping other musicians reach their goals. Her mantra is “community and content” and she started her own consulting business, Social Thinkery. While wearing her Thinkery cap, she helps musicians and other small business improve their web presence and engage their community using her years of experience and yes, that history degree.